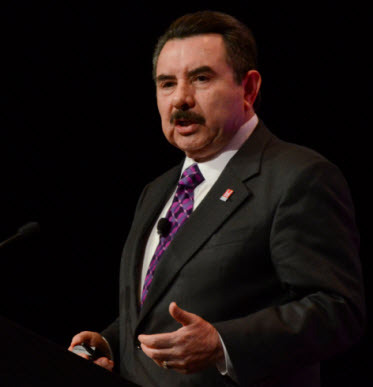 The Hispanic Association of Colleges and Universities President and CEO Antonio R. Flores spoke at the “Focused on the Future: Innovation and Investment at HBCUs,” conference convened by Educational Testing Service Conference and National Urban League on October 23, 2018, in Princeton, New Jersey. Flores addressed the topic “Introduction to Funding: Title V and Title III, Part F: A Retrospective and Projection on Funding.” The presentation included historical information about Title V and Title III, details about the funding gap for Hispanic-Serving Institutions (HSIs) compared to other higher education institutions and highlighted how HSIs, as well as other Minority-Serving Institutions, rely on this funding to serve a diverse student body that represents the future workforce of the Nation. According to Flores, nearly two of every three Hispanic college students attend an HSI; however, HSI impact goes beyond Hispanic students. Flores explained that HSIs are the gateway to higher education for students from a diversity of racial and ethnic backgrounds. As home to 21% of African Americans, 39% of Asian Americans, and 18% of Native Americans in college today, these institutions are the most racially and ethnically diverse segment of U.S. higher education institutions, said Flores. HACU represents more than 500 members that include colleges and universities committed to Hispanic higher education success in the U.S., Puerto Rico, Latin America and Spain. Founded in 1986, HACU is the only national association representing existing and emerging HSIs.